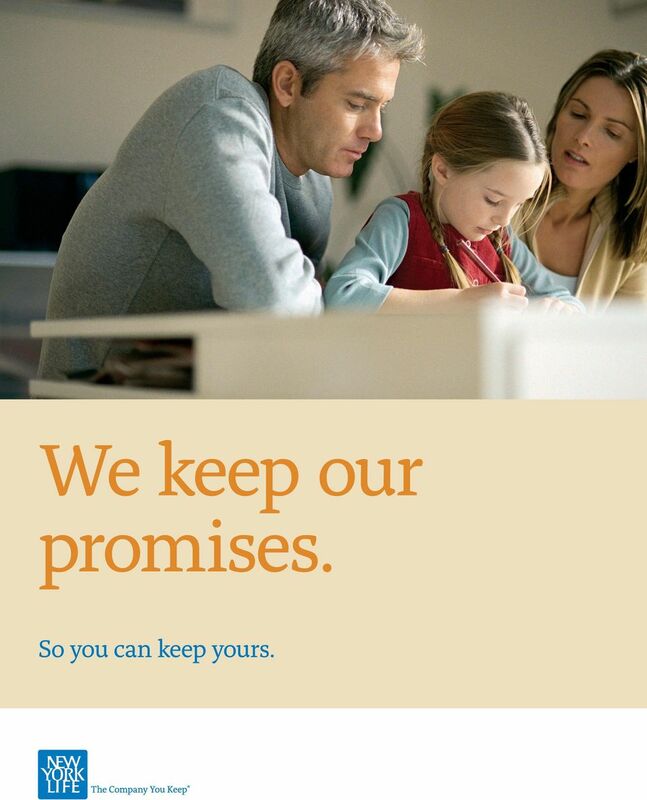 Download "We keep our promises." 1 We keep our promises. So you can keep yours. 2 It s a selfless act. The decision you make today is for someone else s future. 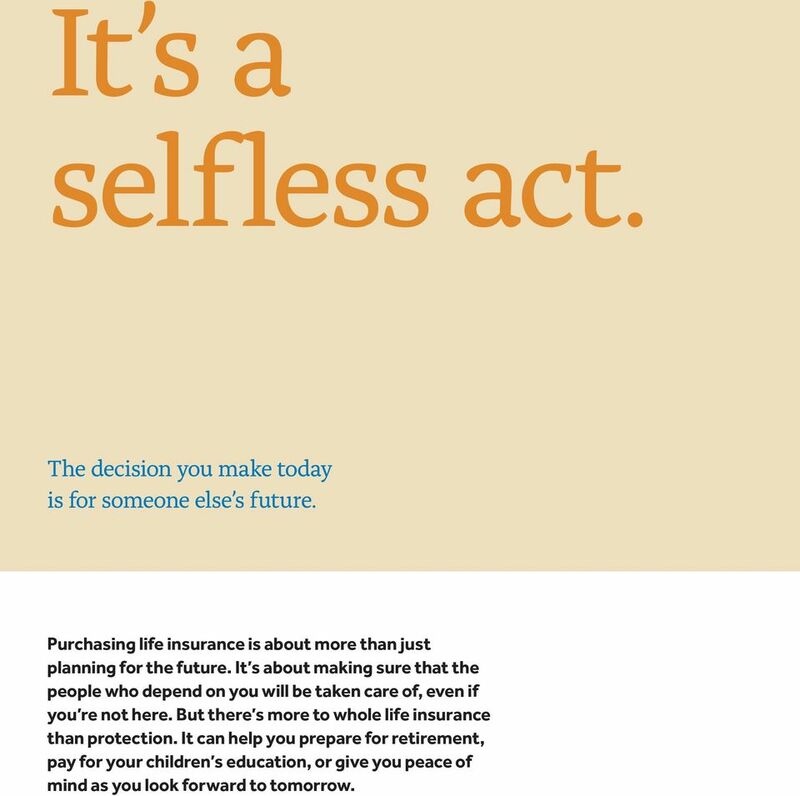 Purchasing life insurance is about more than just planning for the future. It s about making sure that the people who depend on you will be taken care of, even if you re not here. But there s more to whole life insurance than protection. It can help you prepare for retirement, pay for your children s education, or give you peace of mind as you look forward to tomorrow. 4 What it is and how it works. Whole life insurance is a type of permanent life insurance protection designed to last a lifetime. Tax-free access to cash values 4 Income tax-free death benefit Protected from creditors 3 Guaranteed death benefit 1 Whole Life Premium guaranteed never to increase Additional growth through dividends 2 Guaranteed cash value growth Whole life is permanent, guaranteed life insurance coverage. Simply put, as long as you pay the premiums, your policy will provide the security of a guaranteed death benefit and an accumulation component called cash value. Tax-deferred cash value growth Death benefit While it s not something people always want to talk about, death benefit protection can give you substantial peace of mind, especially if you have a family, a business, or others who depend on you financially. Your policy s death benefit can help pay off a mortgage, finance higher education, keep a family business open, or just make life easier for the loved ones you leave behind. You and your agent can decide the death benefit dollar amount best suited to your circumstances. Cash value Cash value is a benefit that is specific to permanent life insurance products like whole life. Your whole life policy provides a guaranteed cash value. As you continue to keep your policy, your cash value will grow. You can access your cash value through policy loans. Over time, it can become a valuable asset that you can use any way you see fit, including for some of life s most pivotal events: Supplementing retirement income as your life insurance needs decrease. 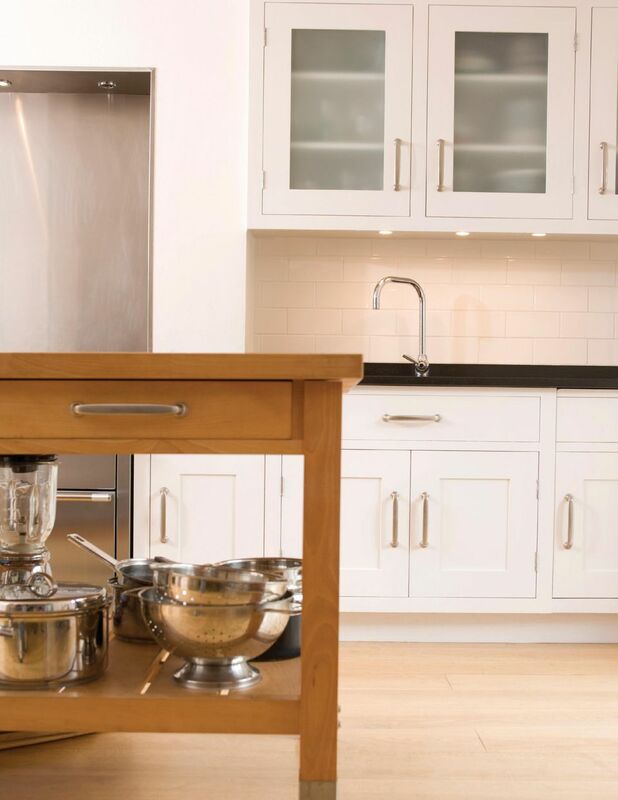 Adding to a down payment on a home. Funding the cost of your child s college education. Financing or starting a new business. Plus, it has substantial tax benefits that make it even more beneficial. It s important to understand that any outstanding loans from your policy will accrue interest and reduce the policy s cash value and death benefit. 1 All guarantees are based on the claims-paying ability of the issuer. 2 Dividends, which provide an opportunity for cash value growth, are not guaranteed. 3 Varies by state. 4 You can access the cash value in your policy, generally tax free, via partial surrenders and policy loans. Policy loans and surrenders reduce the policy s cash value and death benefit. Loans also accrue interest. 5 A full range of benefits. Whole life provides security, peace of mind, and a range of other benefits that make it a smart choice if you re seeking the best possible protection for the important people in your life and a wise financial decision for your own future. Fixed premiums Whole life premiums are guaranteed to never increase for the duration of your policy. While the cost of everything else goes up, your premiums won t. The added advantage of the Premium Deposit Account (PDA) gives you the flexibility to pay off your policy sooner, and at a discount. Living benefits While the primary purpose of whole life is protection, it can also help meet financial needs during your lifetime. These are often referred to as the living benefits of life insurance. Taking loans or withdrawals from your policy s cash value can help pay for unexpected expenses like medical bills or even a down payment on a new home. Tax advantages Your policy s death benefit is generally paid to your beneficiary income tax free. Also, your policy s cash value grows taxdeferred and can be borrowed against, generally on a tax-free basis. 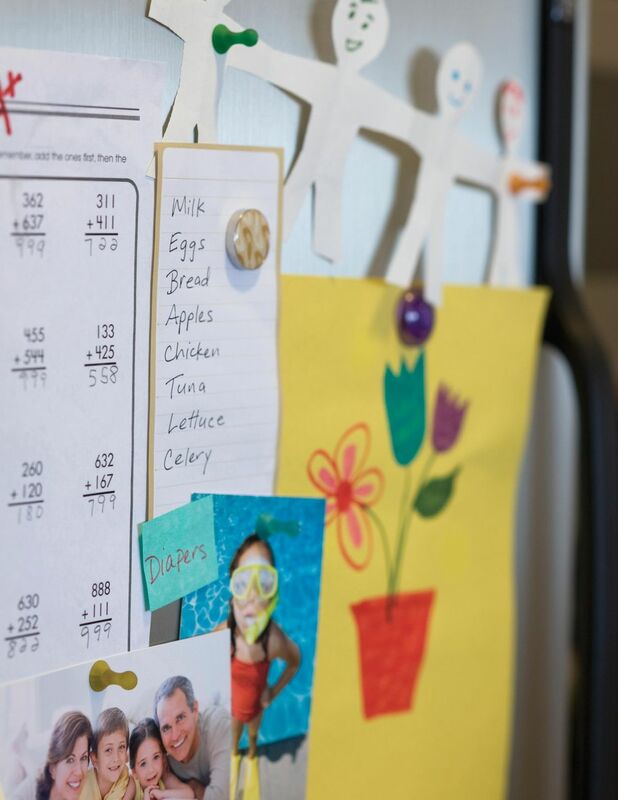 5 These tax benefits can make life insurance an even smarter way to prepare for your future. 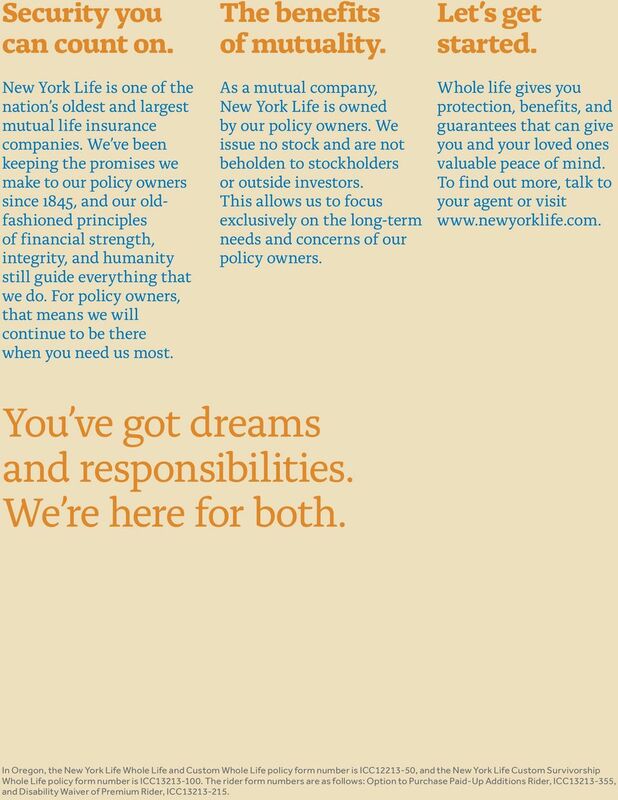 Dividends As a mutual company, New York Life is owned by its policy owners. When you purchase a whole life policy, you are eligible for annual dividends when they are declared. 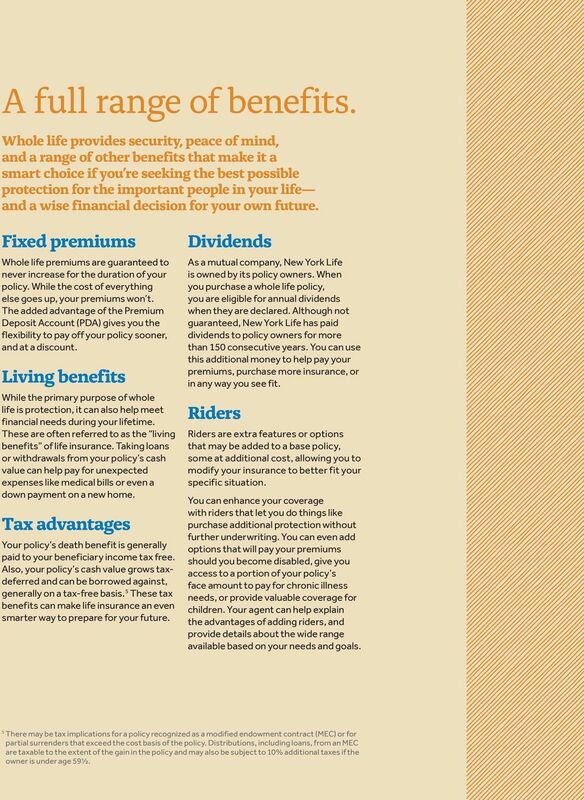 Although not guaranteed, New York Life has paid dividends to policy owners for more than 150 consecutive years. You can use this additional money to help pay your premiums, purchase more insurance, or in any way you see fit. Riders Riders are extra features or options that may be added to a base policy, some at additional cost, allowing you to modify your insurance to better fit your specific situation. You can enhance your coverage with riders that let you do things like purchase additional protection without further underwriting. You can even add options that will pay your premiums should you become disabled, give you access to a portion of your policy s face amount to pay for chronic illness needs, or provide valuable coverage for children. Your agent can help explain the advantages of adding riders, and provide details about the wide range available based on your needs and goals. 5 There may be tax implications for a policy recognized as a modified endowment contract (MEC) or for partial surrenders that exceed the cost basis of the policy. Distributions, including loans, from an MEC are taxable to the extent of the gain in the policy and may also be subject to 10% additional taxes if the owner is under age 59½. 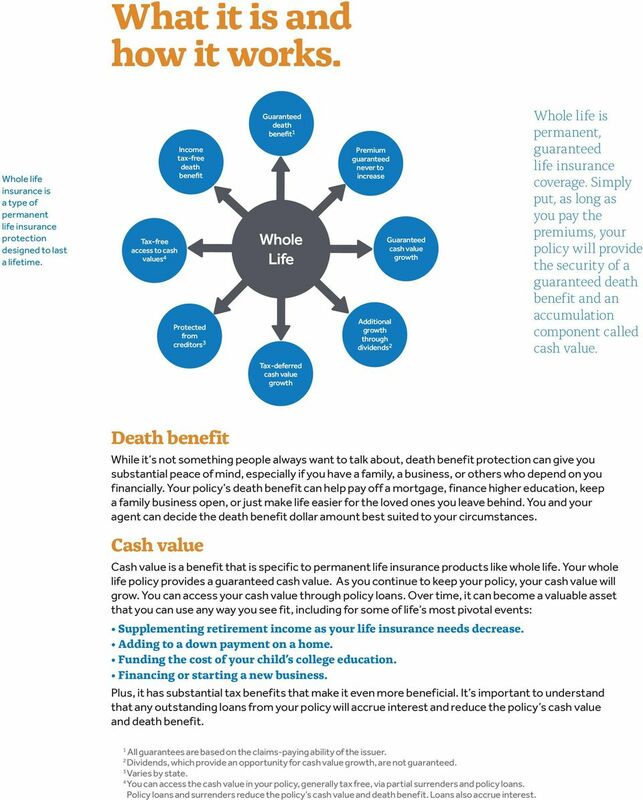 6 Choose from three types of whole life policies. 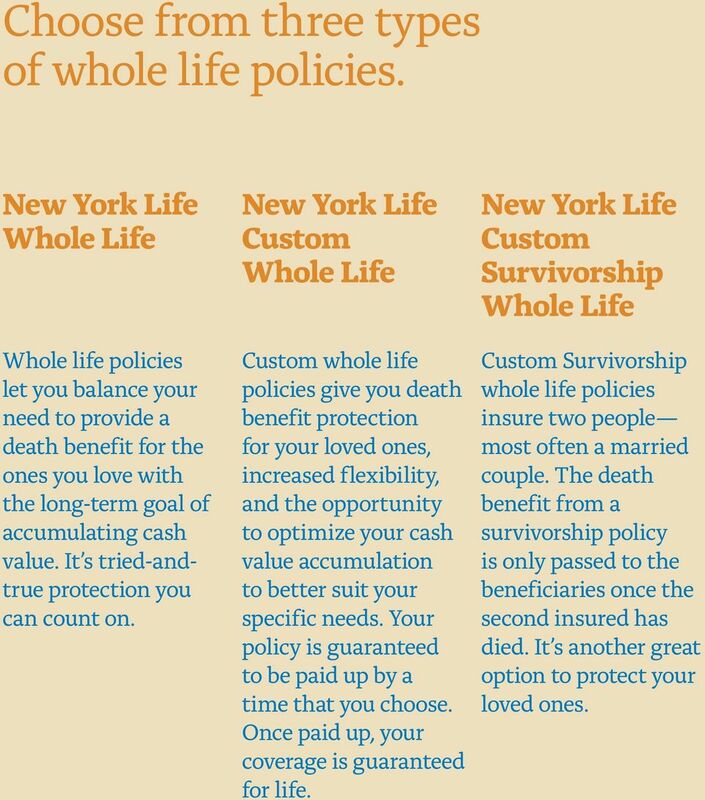 New York Life Whole Life Whole life policies let you balance your need to provide a death benefit for the ones you love with the long-term goal of accumulating cash value. It s tried-andtrue protection you can count on. 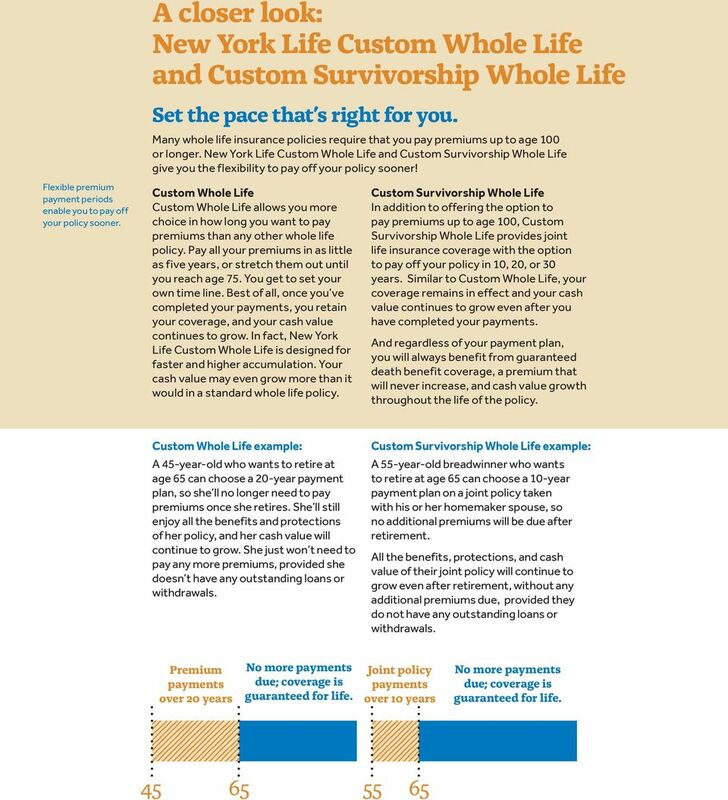 New York Life Custom Whole Life Custom whole life policies give you death benefit protection for your loved ones, increased flexibility, and the opportunity to optimize your cash value accumulation to better suit your specific needs. Your policy is guaranteed to be paid up by a time that you choose. Once paid up, your coverage is guaranteed for life. 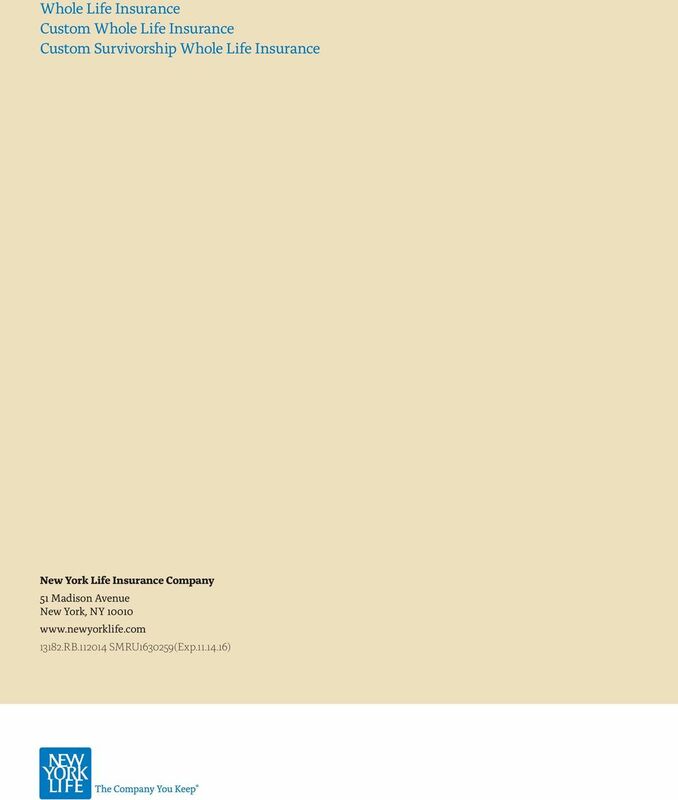 New York Life Custom Survivorship Whole Life Custom Survivorship whole life policies insure two people most often a married couple. The death benefit from a survivorship policy is only passed to the beneficiaries once the second insured has died. It s another great option to protect your loved ones. 9 Our guarantees. 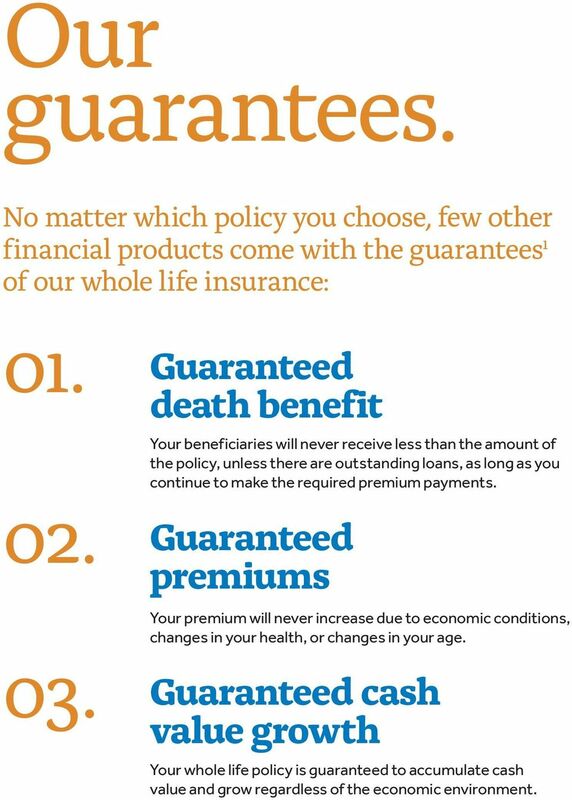 No matter which policy you choose, few other financial products come with the guarantees 1 of our whole life insurance: Guaranteed death benefit Your beneficiaries will never receive less than the amount of the policy, unless there are outstanding loans, as long as you continue to make the required premium payments. Guaranteed premiums Your premium will never increase due to economic conditions, changes in your health, or changes in your age. Guaranteed cash value growth Your whole life policy is guaranteed to accumulate cash value and grow regardless of the economic environment. Are you satisfied with the progress you ve made toward your retirement? Your wisdom is just one gift that can last a lifetime.